Cool Civilizational Death Wish Goes Viral! 'Why do they hate us?' was never the right question. 'Why do they despise us?' is a better one. What's that? All you are saying is give peace a chance? 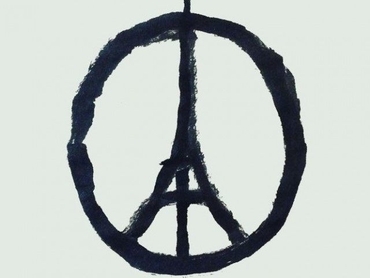 But what, in fact, are the chances of peace for Paris and France? What are the odds? Oh, sorry. All they were saying is give peace a chance. And, having said it, they've gone back to sleep until the next atrocity requires another stupid hashtag or useless avatar. Parisians should be revolted by this third-rate gimmick, and revile those who created and promoted it. ~According to the Government of Greece, one of the Paris terrorists entered Europe as a "Syrian refugee" through the Greek island of Leros on October 3rd. Under the Schengen Agreement, once you've been admitted to one EU country you can proceed, without further inspection by officials, to all of them - save for Britain and Ireland. If either the Schengen Agreement or Angela Merkel's chancellorship survive this revelation, we'll know just how serious M Hollande's "war without mercy" actually is. ~Our Saturday movie feature is on hold, because what I'd written about isn't particularly appropriate in light of yesterday's events. But I'll make a general observation, because I happened to see a trailer today for the upcoming movie London Has Fallen - a sequel to the dismal Olympus Has Fallen, with Morgan Freeman, Aaron Eckhart, etc. The trailer shows London in chaos, death and destruction everywhere, police on the streets trying to hold things together - in other words, just like yesterday's news bulletins but with a different capital city. The bad guy even pledges that he'll be moving on to destroy Paris next, and the Eiffel Tower flashes on to the screen. Being a Hollywood blockbuster, it has a bigger budget than ISIS, so we see a bomb ripping through the Palace of Westminster and causing Big Ben to collapse. Which, one day, the jihad guys will pull off. But that's not the big difference between a night of cinematic terror in London and a night of very real terror in Paris. In real life, the carnage is motivated by men with a vision of victory and a coherent strategy to bring it about. In crappy Morgan Freeman movies, there's no motivation, just the slenderest of pretexts so that everyone can get on with enjoying the explosions unencumbered by anything real. During the Second World War, Hollywood made films about battling the Germans. During the Cold War, they made films about the Russians. But today? They make films about ...nothing. I found the trailer offensive, not because it too obviously echoed last night's news, but because its iconic destruction isn't rooted in anything. 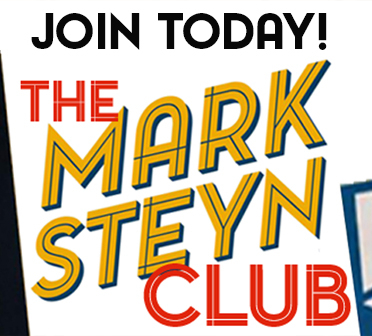 Steyn said, "... I've been listening to you guys all morning, and it's striking to me, every interview you've had, Tucker has said... some variation of: 'Is it really a good idea to admit millions and millions of Muslims to European countries?' And people then start to tap dance around that issue, but when you get to it, that's at the heart of it - that there is a large pool of people who...provide a comfort zone within which this virus incubates. And at some point, if M Hollande, and Mr Cameron, and all these people talking about 'our values' this morning are serious about that, they will have to do as Tucker did and ask themselves that question, and come up with an answer to it." When asked if the president realized "we have different values from the people who did this," Steyn answered, "No, he doesn't... When you get to Charlie Hebdo in January, the majority of Muslims, in France and in other western European nations, do not accept the concept of free speech. Free speech is not a universal value. It arises from a very narrow, particular tradition on this planet, and when your country becomes ten percent, 15 percent, 20 percent Muslim, there's less and less of a market for a free speech. So, despite what Obama, and Cameron, and M Hollande say, that value of free speech will die."